Price includes 10% off Appliances Offer discounts. While supplies last. Add to Cart to See Lower Price. 10% off Appliances until Offer ends. Discount taken off of Special Buy retail. What is the noise level on this machine? I'm looking to replace and older, noisy machine that is in a hallway. Looking for a very quiet machine, if it exists. It's pretty quiet but ONLY if the load is distributed evenly. I've had mine for about a year now and if I do a small load, like no more than half is what is recommended, I rarely need to stop the spin and rearrange the load. If I do a full load, I always have to stop the spin and even then it's very hard to redistribute it evenly. Also, if the machine is not leveled properly in the first place, it will not run quietly. I had to get the installation crew (not from Home Depot) back 2X to level it and they still didn't do it right. Ended up doing it myself. It's very important that the machine not be off level or the load be imbalanced, otherwise essential parts wear unevenly and break. This happened to another washer i owned that was never leveled. If your machine is really noisy, check the levelness and make sure clothes are evenly distributed during spin, even if you put then in evenly. Is this washing machine considered a energy star ? You can vent to the rear or there are knockouts for the left and right side. White Laundry Center with 2.3 cu. ft. Washer and 4.4 cu. ft. 240-Volt Vented Electric Dryer is rated 4.0 out of 5 by 349. Rated 2 out of 5 by Co Rin from Good Size The build quality of this machine is excellent, however the features that it offers is inadequate. I can not fault the Mfr. too much as I believe the US Government has mandated that these features are incorporated with each machine. The primary feature which is adequate is the lack of the ability to determines ones own load size. The machine weighs the clothes to determine how much water needed to clean the clothes. The first few times I allowed the machine to does this I found the cloths to be inadequately cleaned. I ended up wetting my laundry prior to placing them in the machine in order to weigh down the clothes to get more water in the tub. So as it turns out, I now use waste more water now since I can't determine load size. Determining load size by weighing them is stupid and in the long run, inefficient. The second feature is the lid lock feature, which in a word, is annoying. Not everyone who washes clothes has children in the household that will crawl in the tub so why not provide make this feature optional with each machine? Rated 2 out of 5 by Laura from I've been largely disappointed with this washer-dryer since it was... I've been largely disappointed with this washer-dryer since it was delivered. The rim of the washer mouth is jagged -- a defect I suspect is unique to my unit, and not a universal trait -- but the end result is that my clothes are constantly snagging on it. It makes more noise than the last unit, and the lint filter is both inefficient and inconvenient. Inefficient because every time I finish a load, I find lint around the mouth of the dryer. Inconvenient because it doesn't empty easily. You have to remove two pieces to get it out, and due to its irregular shape, it's impossible to simply scoop out all the lint in one motion. The end result of every single load is that there's excess lint that smears on my clothes and spills onto the floor. Plus, I've noticed more runs and snagged threads since I had this model installed. So it's loud, messy, and (in my case at least) defective. On the plus side, it does clean and dry my clothes. I'm stuck with it, but I'd never recommend it to anyone else. 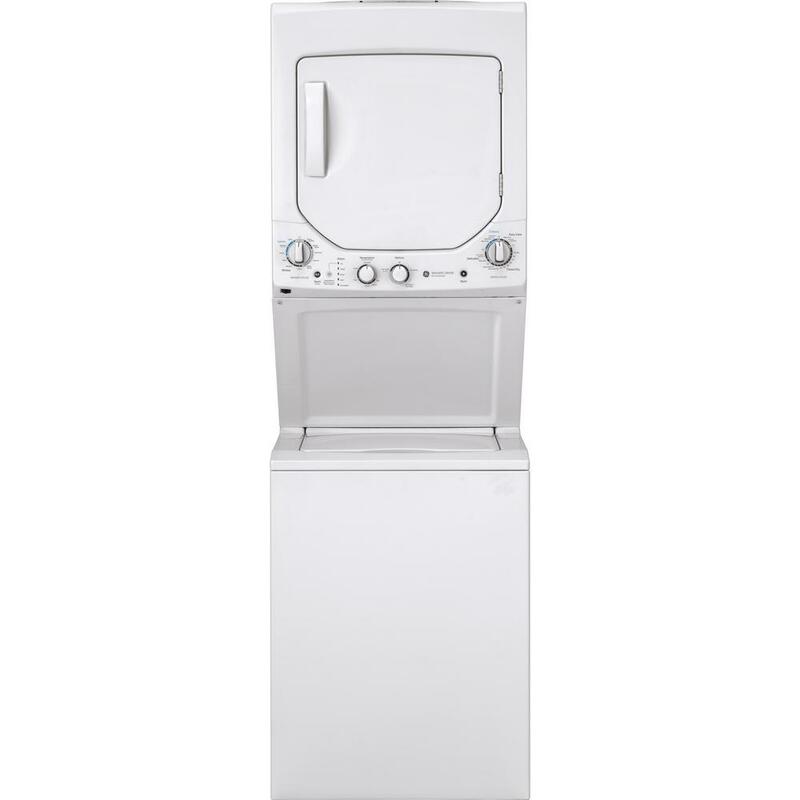 Rated 5 out of 5 by Gwendolyn from GE® Spacemaker Washer and Electric Dryer in white. 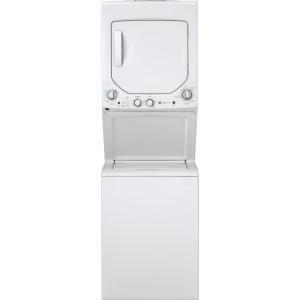 Even though this is a compact appliance for sp... GE® Spacemaker Washer and Electric Dryer in white. Even though this is a compact appliance for space saving you get a lot of appliance for the size. While the tub is a little smaller, it holds a reasonable size wash. The washer has an auto-load sensor, it will automatically measure the load size and add just the right amount of water. This keeps an even balance throughout the cycle. 12 wash cycles are designed to specifically handle various fabrics and soils. Also, 6 wash & rinse temperatures; 1 wash &spin speed combination. Speeds are matched to fabric type. Bleach and fabric softener dispensers are easily identifiable for your convenience. The washer lid automatically locks at the beginning of the cycle for safety. The dryer is very spacious and runs quietly; vents to outside just as any normal dryer does; uses 220-volt, has easy cycle selection, convenient lint filter on door. Home Depot delivers and installs the unit and will also take your old machines if needed. Rated 4 out of 5 by keds1027 from Finally installed my new GE washer/dryer stack. We moved into a condo and didn’t have the space ... Finally installed my new GE washer/dryer stack. We moved into a condo and didn’t have the space for our traditional separate washer and dryer so we searched and decided on this model. We hoped that it would work out and be big enough to handle our usual size loads. As it turns out my wife really likes it. It definitely takes a little getting used to at first but, the washer is plenty big enough and the clothes actually comes out less wet than our old washer and the dryer works better than our really expensive old dryer that we left behind. We have since read several bad reviews but thankfully none of them has happened with this unit so far. The only bad thing is that the dryer is kind of high so my wife has to use a small step stool. As much as I’d like to –but - I can’t blame the manufacturer for that. It does on occasion become out of balance on the spin cycle and it does make some rather strange non earth-like noises but we’ve gotten used to those. At this point we would recommend. Rated 3 out of 5 by 808 Mama from A few tips/info... If you leave the door open while the washer is filled or if it's on pause for a while, then the whole tub will drain after several minutes of not being used. so much for adding in the towel or other items after the kids shower! Be sure to clean the lint filter halfway between your drying time, otherwise lint may fly everywhere as you open the door. Is there no air-dry cycle for this dryer?!? I only see a delicates cylce, that I never used yet, which has a cool down phase indicating that some heat is used. Put it on the "Bulky Items" cycle setting if you're washing several items, otherwise only half the tub (or less) will be filled with water. Yes the other cycle features like all modern washers these days saves water, but I prefer thoroughly washed clean clothes that smells clean! If you're only washing a few things then the other wash cycles (similar to all washers) will make more sense to save water. Rated 1 out of 5 by Eer20 from Terrible downgrade from prior model I had the prior model (ESSJWW) for several years and it worked wonderfully. Unfortunately, I made the poor, hasty decision to replace rather than repair the old model when it ran beyond warranty and had a major issue. What a mistake. The new model (ESSMWW) sacrifices a tremendous amount of the utility and convenience of the former model. It’s much clunkier, noisier, slower. And a terrible design. For example: The dryer lint catcher is now on the door of the drier, rather than in the rear of the machine (why?). This means that lint isn’t caught effectively and instead just wanders around the machine, getting everywhere. Worst of all, the “precise fill” function on the washer, which is supposed to be a function that adds the correct amount of water based on weight, load size, etc is NON FUNCTIONAL. It just doesn’t work. I’ve pulled multiple loads out of the machine where 15 - 20% of the clothes haven’t even touched water. I purchased an extended warranty. I’d rather throw it in the dump. Epic fail, GE. Rated 5 out of 5 by JackinNH from This was just want I needed. I was looking for a washer/dryer that I could put into a closet are... This was just want I needed. I was looking for a washer/dryer that I could put into a closet area sideways. I looked at a number of the front load units that I could stack but then you need a lot of room for the doors to swing open. The smaller profile of this unit and not requiring as much space for the dryer door to open and the washer lid lifts up so no additional space need there. Now that I resolved the space issue I was concerned that anything I would find would then allow me to wash 1 pair of jeans. Not with this unit, I'm able to a load of laundry every couple of days and I'm able to keep up with our laundry with no problem. It is just the two of us so obviously its not like keeping up with a family of 4 or anything. They unit gives me plenty of wash and dry options from delicatse and low heat to heavier duty and more dry options. The energy usage seems to be comparable to my previous energy efficient front loader. If you are looking for a space saver that works like a full size, I recommend this unit. Rated 5 out of 5 by moosebird from Space effiecient I needed apartment size, space efficient, closet-friendly washer/dryer. I was concerned that the 2.3 cubic foot washer capacity would have me washing one item at a time, however, that is not the case. I can load it with a set of queen size sheets - no problem. The big bonus: the spin cycle is very effective. I have experienced much shorter dryer times and when hanging laundry (roughly 50% f my loads) there are no drips! Laundry Center White 1.57 cu. ft. Super Washer and 3.5 cu.